The film is well written, well cast and executed with heart and excitement. It’s a pity that the inevitable overindulgence in computer generated images had to be present, but for once it was balanced with some decent storytelling and “analog” wizardry. It’s like “The Goonies” only in the sense that it’s a kid’s quest, with nary an adult involved. But the mythology associated with the quest is pure British, expanding upon the King Arthur legend and lessening the Disney effect by creating its own tale of kings and knights. The “kid” who would be king is portrayed as a charming outsider, who has had his courage all along, to emerge when his destiny came knocking. This is also one of those rare kid oriented films that adults can equally enjoy. Alex (Louis Ashborne Serkis, son of Andy) is a typical English schoolboy, who is being raised by a single Mum (Denise Gough), and is on the low end of the playground hierarchy. He can’t stand bullying, though, and defends his best friend Bedders (Dean Chaumoo) against the hassling from Lance (Tom Taylor) and Kaye (Rhianna Dorris). His life changes when he comes upon a sword stuck in a stone at a London construction site, and he is able to extract it. 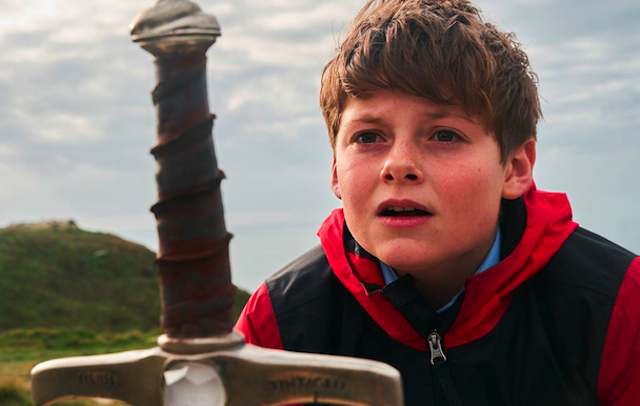 Yes, he is a true heir to King Arthur, and that means that the wizard Merlin (Angus Imrie young, Patrick Stewart old) must come back to help the kid king fight off the sorceress Morgana (Rebecca Ferguson) who desires the sword as Arthur’s half sister. Their battle is a battle for the whole of Britain, and the young king recruits both his fried Bedders and his “enemies” (Lance and Kaye) to sit at the “round table” of alliance, to defeat their common foe. Pretty dang exciting, eh? The story doesn’t mince anything, either, the whole alliance and Alex’s fate is based on true Arthurian legend. The “Code of Chivalry” is the main philosophy and writer/director Joe Cornish uses its truth to motivate the gang’s pursuit. This also comes into play with the relationship between Alex and his Mum, and the facing of their truth is part of what is involved for the kid king. This subtle interplay makes up for the piling on of the CGI (what is it with those tech designer nerds that constantly have us experiencing flaming skulls), and is the strength of the film beyond the battles. 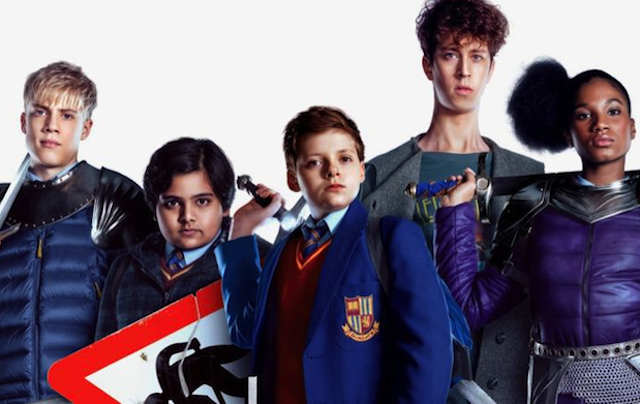 The cast is game as well, and Serkis as the kid king is a particular highlight. In relatively stable home lives, it’s harder to find true courage in childhood, but on the unstable side so many kids either find it or inwardly perish. While making this point, the kid king goes through all of the self doubt and glory of courage, and Serkis is more than up to the task. The young Merlin is a hoot (owl pun) as well, the tic-laden performance by Angus Imrie was both comic and brave (the way he cast spells is hilarious). The teenager upstaged Merlin’s older self, portrayed by Sir Patrick Stewart, the neophyte out-hamming the real knight. The actual battles, mostly rendered with digital enhancements, probably won’t be as interesting to adults as the comedy (some true laughs) and moral code in the story. Cornish didn’t pull any punches as he exposed the modern world for its divisions and rancor. By knighting the kids in the story, the director is providing a nice “what if” for behaviors that will get us out of this mess. The future is unknown, but it can be better if the young ones step up. Of course it is difficult to do any kind of King Arthur movie without thinking of “Monty Python and the Holy Grail.” Cornish chose to have the Lady of the Lake (keeper of “the sword”) present in his screenplay, which is always followed by the “Holy Grail” warning, “Strange women lying in ponds distributing swords is no basis for a system of government. Supreme executive power derives from a mandate from the masses, not from some farcical aquatic ceremony.” Help, I’m being oppressed!